Virtual environment interaction has been studied from different theoretical-methodological approaches. 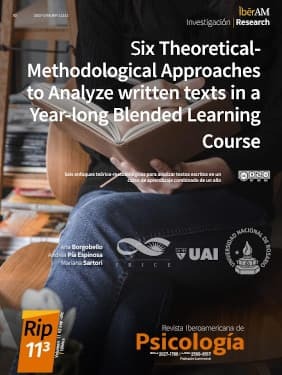 The purpose of this paper is to describe the characteristics of written texts in a blended learning course, and to analyze six theoretical systems that contrast them with data. The collected data come from all the texts written in Moodle by the teacher in a year-long course. The variables were set up from six approaches (coding systems): (a)- Communities of inquiry; (b)- Teaching assistance dimensions; (c)- Macro and micro-scripting; (d)- Twelve ways of teaching; (e)- Rethinking the class; and (f)- Observation record. Reliability and multivariable analyses were carried out. Results showed different consistency of approaches. The analyzed texts revealed how interaction took place and showed pedagogical issues underlying the didactic proposals. Associations among categories produced three typical groups of texts related with the different variables from theoreticalmethodological coding systems used: Cluster 1 gathered general instructions; Cluster 2 illustrated the virtual environment usage as repository; and Cluster 3 represented tutorial interactivity. Future studies should continue to explore these approaches, contrasting them with new data -and vice versa- to get a better understanding of socio-cognitive interaction among students and teachers in blended learning. Aebli, H. (2000). 12 formas básicas de enseñar. Una didáctica basada en la Psicología. Madrid: Narcea. Dillenbourg. P., & Jermann, P. (2007). Designing integrative scripts. In F. Fisher, I. Kollar, H. Mandl, & J. M. Haake (Eds.). Scripting Computer-Supported Collaborative Learning. Cognitive. Computational and Educational Perspectives (pp. 275–302). New York: Springer. Hernández-Leo, D., Asensio-Pérez, J.I., Dimitriadis, Y., & Villasclaras, E.D. (2019). Generating CSCL Scripts: From a Conceptual Model of Pattern Languages to the Design of Real Scripts. In: Goodyear P.; Retalis. S. (Eds.). Technology Enhanced Learning. Design patterns and pattern languages (pp. 49-64). New Milford: Sense Publishers. Retrieved from https://www.researchgate.net/publication/313447046_Generating_CSCL_scripts_From_a_conceptual_model_of_pattern_languages_to_the_design_of_real_scripts. Moscoloni, N. (2005). Las Nubes de Datos. Métodos para analizar la complejidad. Rosario: UNR Editora. Raynaudo, G. & Borgobello, A. (2018, en prensa). Estilos de profesores reconocidos por promover participación en el aula. Revista Intercontinental de Psicología y Educación, s.d. Sanjurjo, L.O. (2003). Las formas básicas de enseñar. En L.O. Sanjurjo & X. Rodríguez (Eds.) Volver a pensar la clase (pp.41-132). Rosario: HomoSapiens. Sanjurjo, L.O. (2016). La práctica como eje articulador de las propuestas curriculares y didácticas en la formación profesional. In M. Insaurralde (comp.) La enseñanza en la educación superior. Investigaciones, experiencias y desafíos (pp.195-206). Buenos Aires, Noveduc.